Halloween is nigh. But today, no tricks. Just treats. I bought these fun test tubes from the Paper Issues online shop awhile back. When I saw the cute seasonal gumballs at Michael's last week, I knew they'd be perfect for a little Halloween project. 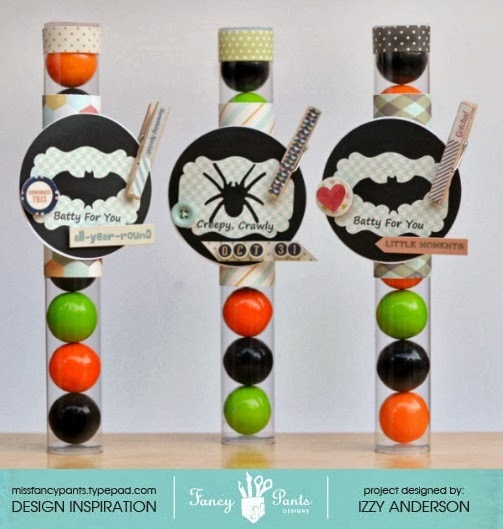 I pulled out the new Fall lines from Fancy Pants Designs to alter the tubes. Though I didn't use a Halloween collection, the orange and green hues from the Happy Go Lucky line worked perfectly. I wrapped a bit of patterned paper around the tubes, using polka dot sticker tapes around the top. I added a round chalk tag to each tube, layering it with punched patterned paper, buttons and stickers. A decorative clothes pin adds a whimsical touch. I think I'll send these to preschool with Cory at the end of the month for his teachers. Meanwhile, they sure look happy and festive on the bookshelf. Thanks so much for stopping by. 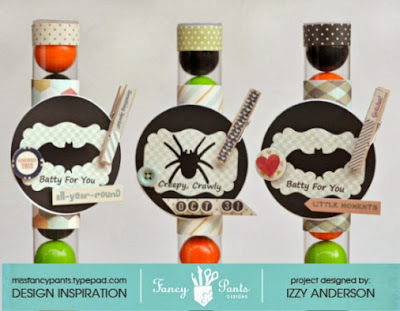 I'll be back on Saturday with the reveal of the new October kits from My Creative Scrapbook. There'll be prizes up for grabs! Ohhhhhh what a great idea!!! I loveeeeeeeeee these!!!! Super, super cute!! I'll have to look for the gumballs! Oooo I LOVE love these!! Soo utterly cool and adorable!! I didn't see those tubes at PI. Loooove! These are so cute, Izzy!! 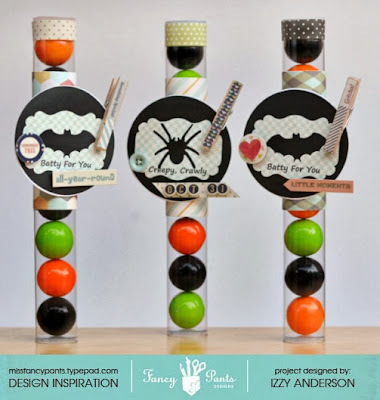 Such a fun project for Halloween treats!